Phoenix Airport, also known by its full, official name of Phoenix Sky Harbor International Airport, is the main airport for the big city of Phoenix, Arizona. It's only a few miles outside of Downtown Phoenix, so is very convenient for people traveling in and out of the Arizona state capital. Phoenix Sky Harbor International Airport is the biggest and busiest airport in all of Arizona, with close to 45 million passengers expected to pass through this airport each and every year to destinations all over the United States and elsewhere around the world, with many major airlines running flights in and out of Phoenix Airport to lots of different countries and destinations. Due to its status as such a large, busy airport, Phoenix Airport has undergone a lot of development and modernization over the years to provide more comforts and conveniences for its passengers. This is why, when you travel via Phoenix Airport, you'll see a lot of shops and restaurants all around the place. But which is the best place to eat at Phoenix Airport? Read on to find out all about a few of this Arizona airport's best eateries. Terminal 2 has a nice range of dining options to choose from for Phoenix Airport passengers. Here are a few examples. 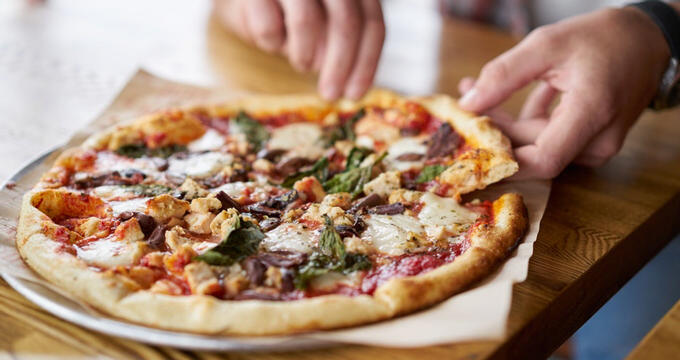 Located before the security checkpoint in Terminal 2, NYPD Pizza has actually been voted as one of the best places to eat in Phoenix Airport by local food critics with the Phoenix New Times, so you're guaranteed a great time if you choose to eat here. You can choose to dine in or take-out at this location, and the pizzas come in a wide variety of styles and sizes to suit all customers. If you've just gotten through the security lines and want to sit down and enjoy a great meal at Phoenix Airport, OHSO is a good place to go. You can get some great craft beers here to go alongside a selection of excellent salads, sandwiches, and burgers. The sweet potato fries are great on the side and the Diablo Burger is a big hit with locals. Also located in the post-security section of Terminal 2 is Paradise Bakery & Café. Leading the way in the café game at Phoenix Airport, Paradise Bakery & Café offers a super range of baked goods like cookies, brownies, and muffins, as well as savory options including sandwiches, salads, and soups. Everything is made fresh here and there's a nice range of coffees and other drinks too. Read on for details on a few of the top restaurants in Terminal 3 of Phoenix Airport. Peet's Coffee is actually the only pre-security dining option you can find in Terminal 3 of Phoenix Airport, so if you want to grab a quick bite or drink before heading through the security lines, this is the place to do so. There's a large menu of coffees and teas here, as well as a few light bites to satiate your hunger before you continue on your journey. Located in the South Concourse area of Terminal C after the security lines, Christopher's offers a fine dining experience right in the heart of Phoenix Airport. Many people expect to find nothing but fast food places and steakhouses in airports, but Christopher's bucks the trend by offering some truly gourmet creations with recipes devised by an award-winning chef. Also situated in the South Concourse area of Terminal C, Mustache Pretzel actually started off as a simple food truck serving the Phoenix area but became so popular it ended up with a fixed location right in the city's biggest airport. As the name implies, Mustache Pretzel offers a great range of tasty pretzels, with some good dipping sauces to go along with them. There are some great restaurants both pre-security and post-security at Terminal 4 of Phoenix Airport. There's some great BBQ food to be found all around Arizona and you can find some super examples of it at Joe's Real BBQ. Located pre-security in Terminal 4, this BBQ place offers genuine, authentic BBQ food that has been slow cooked to perfection. There's a great range of steaks, burgers, ribs, and more here, along with lighter bites in the form of salads, sandwiches, and sides. Located around Gates A15-30 after the security lines at Terminal 4, Delux is one of the best burger places at Phoenix Airport. It makes use of USDA Choice beef that has been raised on a healthy, vegetarian diet to provide only the purest, juiciest, most tender meat every time. You can get a great range of high quality burgers here, with the menu also featuring hot dogs and some fun sides. Around the C Gates area of Terminal 4 of Phoenix Airport, you can find Humble Pie Pizza. You can also find some other Humble Pie Pizza locations dotted around Phoenix Airport, and they're all super places to enjoy some tasty food. Pizza lovers will adore this place, where the only problem they'll face is trying to decide which pizza to try first. The menu is huge, with a great range of topping options and styles to suit everyone. If you're not in the mood for pizza, sandwiches and salads can be ordered here too.